Bizarre and nightmarish fusions of machine and daemonic insect, Blight Drones are hovering killers, their horrific weapons capable of sending swathes of enemy infantry to an unspeakably vile death. Often encountered in clusters and swarms on worlds falling to Chaos, Blight Drones act in the manner of carrion flies or ambush predators, drawn to ongoing bloodshed and concentrations of the dead. First encountered during the later stages of the bitter war for the apostate world of Vraks, nothing akin to Blight Drones had ever been faced before by the Imperium, or at least none had lived to tell the tale of meeting them. When first encountered, after-action reports by scattered and often terribly maimed survivors led to misidentification of the Blight Drones either as conventional flying vehicles of some kind or some form of huge, warp-mutated insects, but as the Inquisition's savants and daemonologists pieced together the evidence, the truth that they were facing some new form of Daemon Engine became abundantly clear. Wherever they are found, the air grows thick with poisonous fumes and the soil blisters and rots beneath them as their corpulent flesh weeps continually with dripping ichor. The maddening, incessant droning buzz of the Blight Drones' rotor discs echoing through the murky fog of war has become an omen of death to Imperial Guard troops. Reports of Blight Drone attacks spread quickly through the ranks, the negative effect on morale such a serious concern for the commissars that those found to be repeating such stories face arrest and redeployment to the penal units. The Blight Drones' macabre and deadly reputation is more than matched in dreadful fact by their effectiveness on the battlefield. Armed with rapid-firing light cannon and a maw-like weapon spewing jets of corrosive toxic bile strong enough to eat through metal and liquefy flesh in seconds, they are deadly to entrenched infantry and light vehicles, while troops caught in the open stand little chance against their swooping assaults. 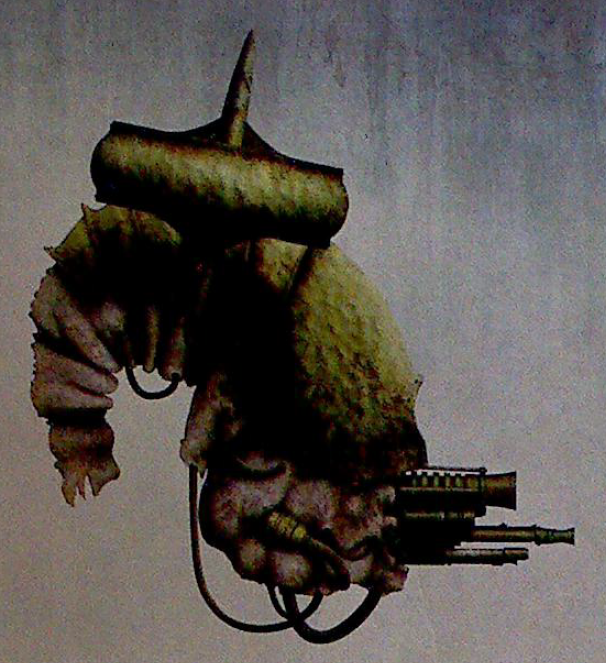 The Blight Drones' squat, bloated form is unusually resilient to weapons fire, a factor attributed to their seemingly 'living' flesh and rusted armour plating, as well as the will of whatever dark intelligence guides them. Unconfirmed reports speak of these Daemon Engines coming down to rest on piles of corpses seemingly to 'feed', liquefying the carcasses of the dead and the dying and sucking up the decaying sludge, perhaps to fuel themselves or maintain their presence in the physical universe. 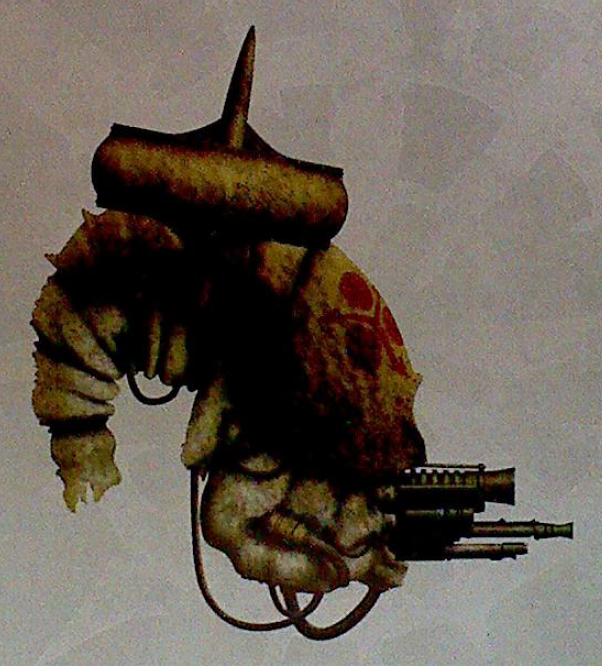 Since the Vraksian conflict, Blight Drones have been encountered in numerous battles, notably fighting alongside the renegades known as the Purge and several Death Guard splinter factions. Unconfirmed reports have placed these obscene weapons as part of the daemonic incursions in the Auralis Wars, the Charadis Rifts and the fall of Mitra Prime in the opening battles of the 13th Black Crusade. See page 191 for additional weapons rules and profiles. When a Blight Drone is destroyed, it invariably detonates in a shower of bile and pus. When the Blight Drone loses its last Hull Point, it always explodes as per the Explodes! Vehicle Damage table result rather than becoming Wrecked. Blight Drone, believed summoned by Sorcerers of the Tainted, Siege of Vraks, 830.M41. Banished by Grey Knights in final battle for Sector 593-440.